The main target of this project is to establish during three years not only a high-standard scientific laboratory but as well a research, educational and clinical center in the field of regenerative medicine (RMC), which will be internationally recognized through publications in the high-impact journals and presentations on large international events. The main aim in the basic scientific aspect is the evaluation of the molecular mechanisms and underlying pathways of regenerative medicine approaches to tissue engineer and cell therapy of the airways and lungs. The biomedical goal is to create new regenerative methods of organ’s replacement and/or restoration, which will be a needed alternative and avoid human donation of organs and immunosuppression, and transfer them to the clinic for prevention and effective treatment of wide range of end-stage diseases. The reality of this goal is based on the unique experience of the leading scientist who is both a well-known translational researcher and a transplant surgeon. During past several years, he established the internationally recognized laboratories in Sweden, Italy and Spain by focusing to the international collaboration and creating the equal standards in this new field. In 2010 he held master class on the regenerative medicine in Moscow where about 100 cell biologists, transplantologists from the different labs and hospitals from all over Russia took part. After that the specialists of the B.V. Petrovski Russian scientific centre of surgery RAMS were trained at professor’s Macchiarini lab in Florence and in December 2010 in Moscow they together made successful transplantation of tissue-engineered trachea to the patient – first in Russia and ten’s in the practice of Professor Macchiarini. On the other side, the reality of this goal is based on the unique infrastructure created by Kuban State Medical University, which includes educational, clinical, experimental facilities and at the same time – big enthusiasm and potential for developing. The creation of this new regenerative medicine unit should help the Kuban State Medical University to become active internationally recognized educative and research center with strong clinical support. This goal can be achieved through several interrelated steps plan. 1)RMC will be equipped with the advanced facilities, such as work benches, cell culture room, consumables, small animal surgery working places, decellularization and testing devices, incubator, fridges, facilities for histological and immunhistochemical evaluation, FACS Analyser, several types of microscopes, PCR, real time-PCR, Western blot devices, etc. All this facilities and equipments will allow to provide the highest level of all necessary experimental work in the fields of molecular and cell biology, tissue engineering, regenerative medicine. An intensive in vitro phase will be performed and variable evaluation processes conducted. Initial findings of previously performed studies of cell therapy in pulmonary hypertension and cell application for tracheal tissue engineering will be standardize and verify. Underlying pathways should be elucidated to enhance the knowledge of stem cell biology. In vitro studies will be ongoing and continue after the time of project fulfillment for solving wide range of basic scientific tasks in this field. In vitro findings will be evaluated in several in vivo animal models, from rats to non-human primates. 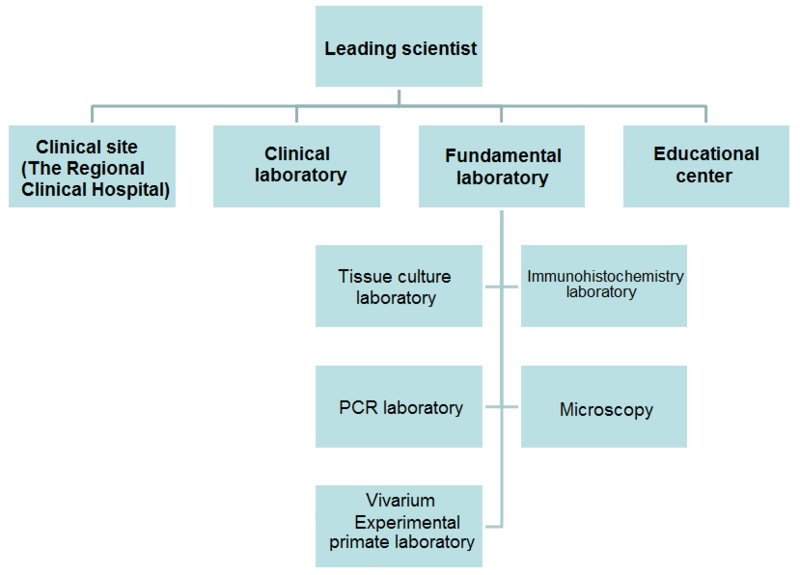 During in vitro and in vivo animal studies the following investigations should be performed: evaluation of the angiogenic potential of the electrospun scaffolds consisting of combinations of PCL, gelatin and angiogenic factors; testing and improving bioreactors to obtain automation of airway and lung decellurarization and recellularization protocol; development and characterization of biologically-derived and/or synthetic hydrogels; evaluation of the “boosting” regenerative therapy on airway constructs; developing of a strategy to obtain in vitro epithelial sheets for bioengineering airway grafts. After accurate evaluation of all pre-clinic data the concept will be transferred to the clinic. A selected number of patients with severe progressive pulmonary hypertension and non-respondent to conventional treatment will be treated with the investigated stem cell therapy. A selected number of patients with end-stage lung diseases and no chance to obtain a donor lung within reasonable time will be treated with the engineered lung tissue. (overall – 3-5 patients). RMC’ staff will be trained in the leading scientist’s laboratories and collaborators in Karolinska Institute (Sweden), Department of Regenerative surgery and biotransplantation of Carreggi Hospital, University of Florence (Italy). Strong collaboration will be established between the Kuban State Medical University, Regional Clinical Hospital named after professor S.V. Ochapovsky, The Research Institute of Medical Primatology of the Russian Academy of Medical Sciences for accumulate activity in the frame of this project. Collaborative research will be performed with the Russian Academy of Sciences organizations (e.g., Institute of Developmental Biology RAS, where the leading scientist has strong collaborative contacts) and foreign and international organizations, such as European Airways Institute, Karolinska Institute, Hospital Carreggi, University of Florence and other. This allows to use together biological, molecular/proteomics, pathological, toxicological, animal, and clinical facilities. Final step is to transform all appropriate infrastructures to the status of International Research, Educative and Clinical Center of Regenerative Medicine based on the Kuban State Medical University. Such type of center could perform various functions during the period of grant fulfillment and in future. It can serve as a platform for introducing new regenerative technologies. Simultaneously with the main goal of current project the scientific researches will be conducted in the field of regenerative technologies for creation of the different tissues and organs. development of regenerative technologies in ophthalmology (creation of cornea, vitreous body, lens). The facilities of the Center, experience of it’s stuff will create a basis for establish new special structures and companies, such as “Cells and Tissue Bank” and Laboratory “BioTrachea”, which can provide biomaterials for the purposes of the clinic. The accumulated experience and created biomedical technologies will allow to start the development of the regenerative methods for the treatment of burned patients, and also - in otorhinolaryngology, stomatology, diabetology. The investigation of genetic basis of socially significant diseases at the PCR laboratory will be started on the higher level. Center will carry out methodological work for creating and approval standards of the regenerative medicine, registration of new medical technologies in the Ministry of Health and Social Development and other official structures of Russian Federation. The participation in the Federal Target-Oriented Programs is planned. Proposed staff by 2013: Professor (1), Ph. D. (3), MD (2) researchers, Ph.D. students (5), undergraduate (5) students, engineer (1). Education will be the main part of the Centers’ activity. Students and post graduates are to be taught during the research process and at the same time laboratory will use University staff and cooperate with it’s other departments. During 2011-2013 the course of lectures on the regenerative medicine for students and for advanced training will be prepared. Elective course “Regenerative Medicine” for under graduated students will be organized. There will be prepared special cycles of lectures for scientists, physicians and surgeons (for up to 100 academic hours) – such as “Immunological aspects of regeneration”, “Genetic technologies of regenerative medicine”, “Organs’ and tissue transplantation” and others. The ongoing School of Regenerative Medicine will be organized on the base of the Center. The education process will also be supported by well-known specialists on cell biology, developmental biology, transplantology, tissue-engineering from Russian and foreign research institutes. Therefore, by 2013-2014 Center of Regenerative Medicine will become not only research, but also the education center and can accept PHD students from other Universities. The international changing programs will start. graduate at list 10 MS and 4 PhD in the field. Research benefits: Getting important fundamental knowledge about stem cell behavior, which is absolutely necessary to understand in vivo processes and interactions. Creating new methods of organ’s reparation, which could be transferred to the clinic. Educational benefits: There are the opportunities to develop novel and model educational programs for students in the field of Regenerative Medicine focused on interdisciplinary graduate and postgraduate students’ programs.